CABLE HIGHLIGHTS: The NBA PLAYOFFS were once again on top, with double features on both TNT (1.39/0.87) and ESPN (1.27/1.17). Adult Swim had 3 of the next 4 slots, with 0.67 (up 0.10) for KILL LA KILL, 0.65 (up 0.12) for SWORD ART ONLINE, and 0.56 (up 0.18) for INUYASHA, all of which aired in the 12:30-2AM very late-night hours. HBO as usual reported its BOXING ratings in pieces, ranging from 0.63 to 0.48. 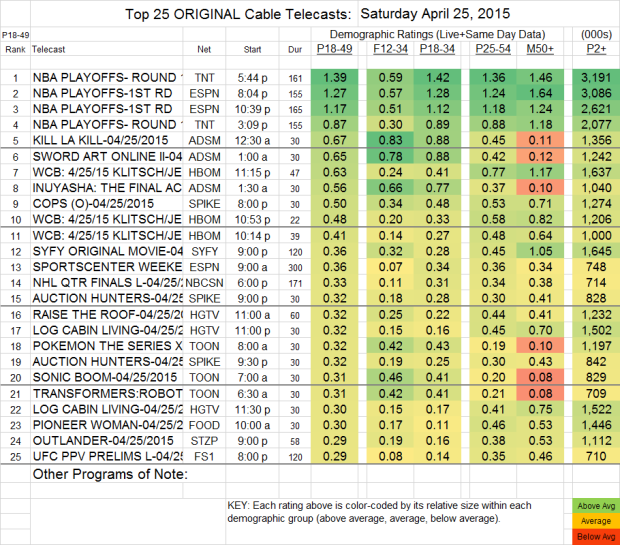 At 0.32/0.30, HGTV’s LOG CABIN LIVING was down from last week’s 2 episodes at 0.41/0.38. OUTLANDER (Starz) slipped 0.02 to 0.29. Airing this week on BBCAmerica alone, ORPHAN BLACK was down 0.05 to 0.14, although last week it also aired on 4 other networks for a cumulative 0.21. TATAU lost more than half its 18-49 viewers at 0.03, and about half its total viewers at 124K.